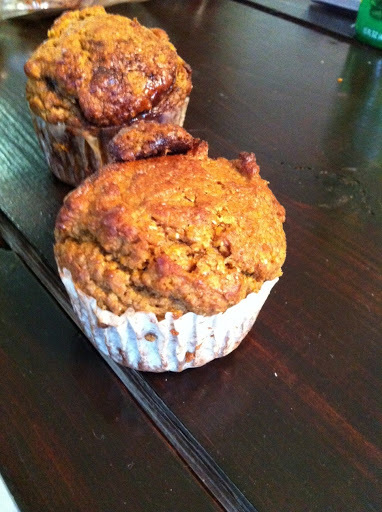 I made these because I wanted to make a healthy, delicious and seasonal muffin for my little sister since she’s a big runner, but also really enjoys life (which naturally carries over into food in my opinion ;)). Pumpkin is one of my favorite fall foods and Nutella is one of hers, so I figured why not combine the two?! In the end, I’m glad I did! Preheat oven to 350* and prepare 2-12 count muffin tins (either with paper or greased). Combine dry ingredients. Combine wet ingredients (minus the Nutella) in a separate bowl. Mix wet into dry until combined. Do not over mix. Spoon 1 heaping tbsp or 1 cookie/ice cream scoop of batter into 24 prepared muffin spots (2-12 muffin tins). Make a small hole with the end of a spoon in the batter. Spoon 1 tsp Nutella into each muffin hole. Cover with remaining batter. Bake at 350* for 35 minutes. You could have these for breakfast or snack! The fiber in the pumpkin should keep you fueled and full. And since there is no added oil, these shouldn’t weigh you down!